LESS THAN 24 HOURS TO GO! at News Aboriginal Art Directory. View information about LESS THAN 24 HOURS TO GO! For $500 or more you could earn yourself an original water-colour from Hermannsberg and help to complete a documentary film about that school of painting, about the life of its founder, Albert Namatjira, and about joys and tensions of a non-Indigenous theatre-maker and an Aboriginal actor creating a play featuring Albert and his white mentor, Rex Battarbee. Long-time Ngurratjuta Many Hands Art Centre collaborator, the Big hART theatre company have been working with the Namatjira family and artist communities for the past 6 years. Together they wrote a theatre show which has toured Australia twice and been seen by 50,000 people. It also went to London and the cast and accompanying artists were invited to Buckingham Palace to meet the Queen. For, alongside each theatre performance was a partnering exhibition of contemporary watercolours by Namatjira descendants. The widespread coverage of the theatre show was fantastic exposure for the artists and art centre - a core goal of the trip to London. Throughout Big hART’s work with the artists, a documentary crew has been capturing pivotal moments of the project, working with the Namatjira family and Hermannsburg communities. We are proud to have been a supporting partner throughout the Project and we are asking for our friends and followers to consider making a pledge to a crowdfunding campaign. The funds will enable the completion of the documentary which will raise the profile of the art centre and work towards sustainability for the Hermannsburg art movement in the future. As part of the campaign you can get a beautiful original artwork by Lenie Namatjira, Gloria Pannka, Ivy Pareroultja, Mervyn Rubuntja or Peter Tjutjatja Taylor as a reward. A great way to lend your support in two ways at once! Help Big hART rally support for Ngurratjuta Many Hands artists – get behind the Namatjira Documentary crowdfunding campaign. Just 23 hours to go as I write for the campaign to meet its target. 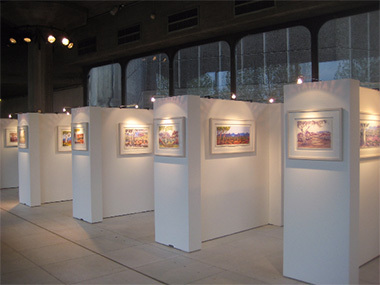 The sold out exhibition of contemporary watercolours in London – organised by the dynamic Helen Read of Palya Art - which accompanied the Namatjira play. 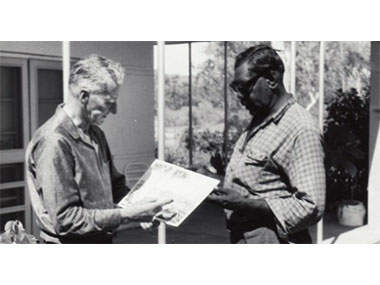 An old photo of Rex Battarbee and Albert Namatjira in discussion.